Or view larger version. Untitled. May 22, 1969. Lonnie Wilson, photographer. Gelatin silver print. Collection of Oakland Museum of California. The Oakland Tribune Collection. Gift of Alameda Newspaper Group. 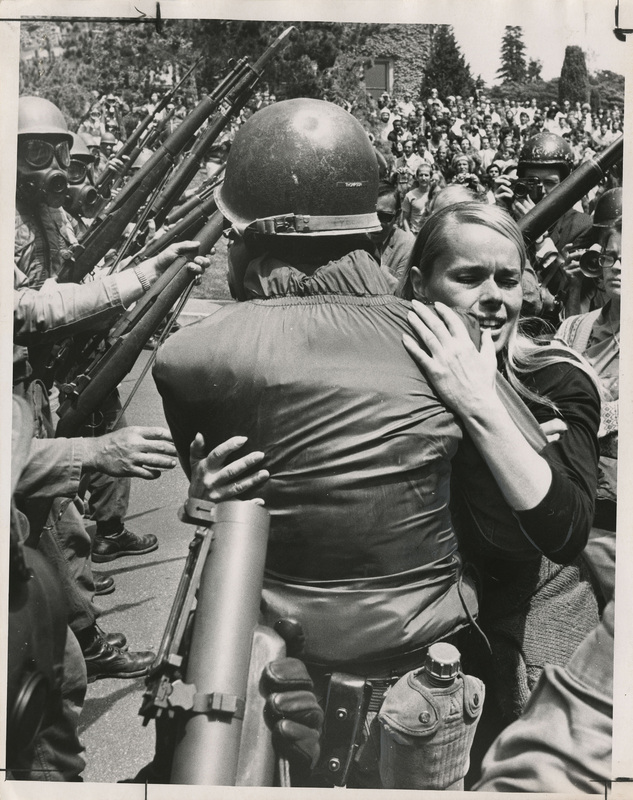 This is a photograph of a young woman embracing an armed National Guardsmen during a protest on the University of California, Berkeley campus on May 21, 1969. The protest grew out of a conflict between the residents and merchants of the south campus Berkeley neighborhood, UC Berkeley students, and the UC Berkeley administration. Although the administration conceded to the demands for the creation of a park, the governor of California, Ronald Reagan, at the urging of Berkeley’s mayor sent in the National Guardsmen to break up the protests.